Las Vegas Motor Speedway will continue to make history in 2019 by pairing the NASCAR K&N Pro Series West and World of Outlaws events for the first time. 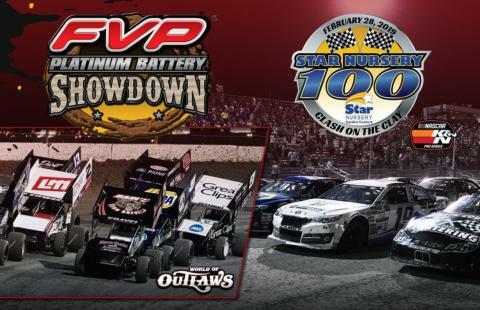 The Star Nursery 100 NASCAR K&N Pro Series West event will take place at the LVMS Dirt Track on Thursday, Feb. 28, as part of a double feature along with the second night of World of Outlaws racing. 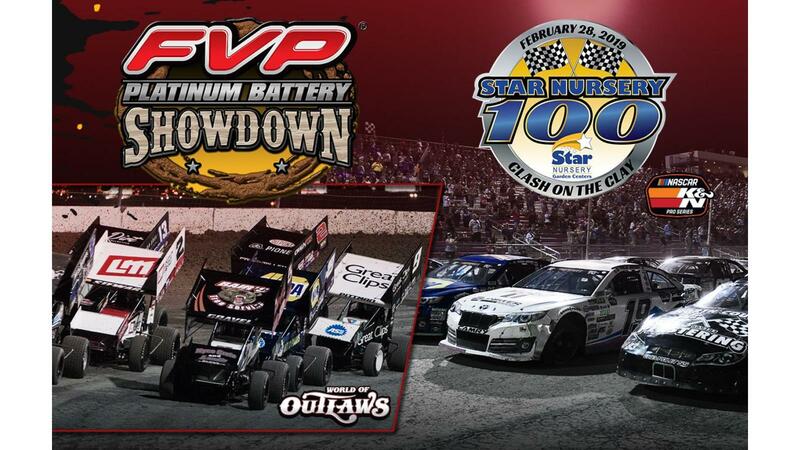 The World of Outlaws FVP Platinum Battery Showdown presented by Star Nursery will run Wednesday, Feb. 27, and Thursday, Feb. 28, helping kick off the track's Pennzoil 400 presented by Jiffy Lube NASCAR race weekend. The combined event will give LVMS five consecutive days of racing at its nearly 1,000-acre facility. The Stratosphere 200 NASCAR Gander Outdoors Truck Series race will follow the Dirt Track events on Friday, March 1, with the Boyd Gaming 300 NASCAR Xfinity Series race taking place on Saturday and the Pennzoil 400 presented by Jiffy Lube Monster Energy NASCAR Cup Series event anchoring the weekend on Sunday. "We had four consecutive successful days of racing at Las Vegas Motor Speedway in September, and we're excited to increase that to five days in a row this spring," LVMS President Chris Powell said. "Combining the NASCAR K&N Pro Series West and World of Outlaws series has never been done before, and we've become accustomed to making history here in Las Vegas in recent years. This racing lineup will appeal to a variety of racing fans and is further proof that we are indeed the world's most versatile motorsports facility." The 2018 Star Nursery 100 - won by Sheldon Creed in September - marked the first NASCAR K&N Pro Series race on a dirt track since 1979. "The inaugural Star Nursery 100 was historic. Returning to the dirt for the first time in almost 40 years, Hailie Deegan winning the pole and long-time team owner Matt Levin winning his first race thanks to Sheldon Creed's late dash made this an unforgettable event," said Brandon Thompson, managing director of NASCAR regional series. "It's rare to make history with an event two years in a row, so we're excited to return to Las Vegas for an even better show in 2019." LVMS has hosted World of Outlaws events at its half-mile Dirt Track dating back to 1996 and has held double features every spring since 2013. "We're excited our traditional two-day event in Las Vegas is continuing to grow with the addition of the NASCAR K&N Pro Series West," World of Outlaws COO Tom Deery said. "We're also looking forward to showcasing this historically popular event with our style of high-horsepower, high-speed, winged Outlaw dirt racing to a whole new audience. We like making history with our World of Outlaws events, and combining with NASCAR on the same night at the same track will certainly be a first that no one will want to miss." Various ticket packages, fun extras and special-access passes for LVMS's first NASCAR weekend of 2019 are available at www.lvms.com or by calling 1-800-644-4444. The 2019 Fall NASCAR Weekend hosts the Monster Energy NASCAR Cup Series, the NASCAR Xfinity Series, and the NASCAR Gander Outdoors Truck Series.